Growing Green: JUST SAY "REECK"
Like most people, my dad, Clarence Reeck, received his last name from his ancestors. Since Clarence is such a key player in my book, Growing Green Two Ways!, I want to explain about his almost-unique surname. Family records confirm that persons with the Reeck surname immigrated in the 1870s to the United States from Stettin (German) or Sczcecin (Polish,) a harbor town on the Baltic Sea. But how did the name Reeck get linked with that part of the world? I asked a German language historian. He explained that “Reeck” originated along the Dutch/German boundary at the bend of the lower Rhine. He speculated that Dad’s Reeck ancestors migrated to Pomerania as settlers in medieval times. Thanks for the social history. But does "Reeck" appear as a place name? Yes, there’s a Reeck Canal and a Reeck Lake in northern Germany. There’s a Reeck Road in Southgate, Mich. No mountain, no claimant to the world’s tallest building is yet named Reeck, and I’m not counting. Does “Reeck” have a meaning? Yes, it connotes “smoke” in German. Is it properly spelled as R-e-e-c-k? Yes! That’s the spelling that appears in all of the handwritten baptismal certificates of Clarence’s European ancestors. Are there any famous Reecks? Yes, but only one: a highly-placed Belgian ambassador, Marc van den Reeck. It's rumored that many other Reecks will be famous soon. Would I rather have a different family name? Well, what are my options? Rich, Johnson, or Smith? They’re all great surnames! But times change, and Reeck has a huge advantage now. It’s an easy Internet search to find a specific Reeck. For example, there’s only one Clarence Reeck but just try to find a certain Clarence Jones. “Unique Reeck.” That’s my slogan and I’m sure my dad, Clarence Reeck, would appreciate that too. Bottom line: please make sure that you’re not confusing Reeck with the noun reek! The Scottish noun is okay, but not the English. Now, please favor me. Go here to go to the Facebook page Growing Green Two Ways! Once there, click the Page Like button. It’s the Like button just under the Mt. Rainier photo. “Growing Green” needs page likes—101 of them. 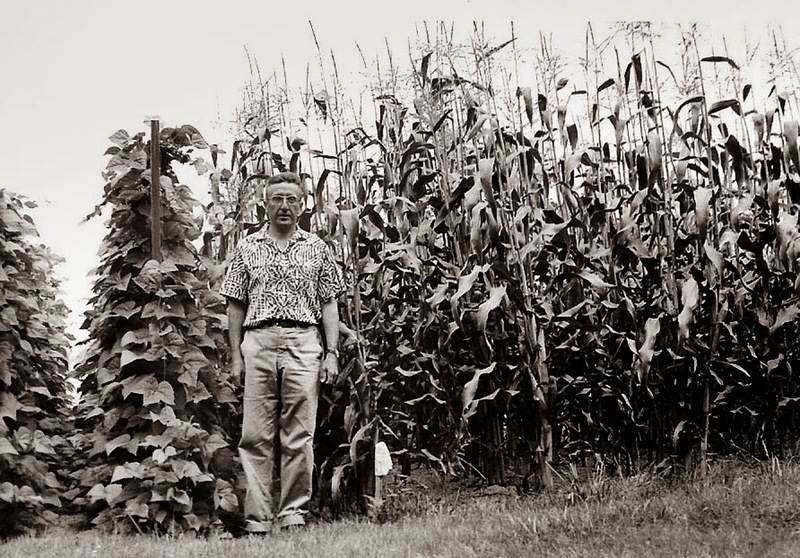 And to find much more about the dedicated organic gardener, Clarence Reeck, download the Kindle version or order the hard copy of Growing Green Two Ways! He's a star. Thank you, Friends and Readers!